Even though I watch a lot of Japanese films and was part of a film club at my university that screened films regularly on campus, the notion of going to the cinema while on my trips to Japan to experience these films on the big screen rarely occurred to me. When I was going to school in Japan I was thinking about going to the cinema to see the latest Ghibli film at the time, From Up on Poppy Hill, but decided not to...and again when I was there last year I had thought about seeing another Ghibli film, When Marnie was There but that didn't pan out either. In the limited time I spend in Japan and with all the moving around and going to concerts, events and the like, a two hour excursion to the theaters just never really fit into my trip planning. Plus, the obvious language barrier was always there and I never wanted to sit down and pay for a film that I wouldn't understand. This time, though, I suddenly decided to make up for lost time and planned to see some films in Tokyo, given my Japanese has gotten better over the years too. 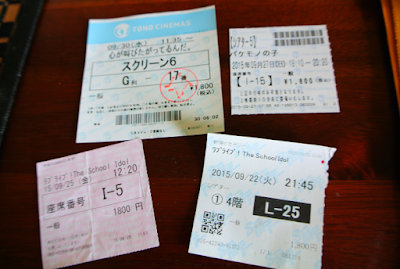 In the process, I discovered a wealth of interesting places via the internet for people looking to see any kind of film while in Japan. A Cinephiles Guide to Tokyo is a great start, and then there was the interesting double-bill art-house theater called Waseda Shochiku which you can read about in this great article. 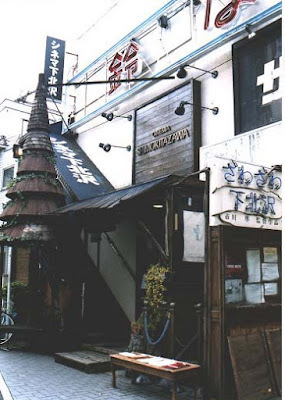 There was one theater that held some overnight events from 10PM to 5AM in Ikebukuro and other art-house places that catered to all tastes, too, both in foreign classics and recent underground Japanese films. 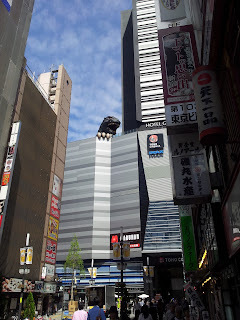 Unfortunately there aren't too many out there, but the guide I posted above is a pretty good run down of where to see independent and classic films in Tokyo. Unfortunately I didn't venture to any of these revival cinema houses while I was on my trip, although I most definitely wanted to. Instead, I saw three recently released animated films in four different cinemas across Tokyo (I saw one film twice, Love Live!). Each had its perks, but across the field there were a couple of general differences between the movie theaters in Japan and those back at home so I thought I would share some of them here for those that might be planning to check out a film in Japan and might not know what to expect. Ticket stubs are nothing fancy. Notice the letter and number on each ticket for the seating assignment. 1) You have an assigned seat that you have to choose when you purchase the ticket. The attendant will show you a little card or digital menu with the seats in relevance to the screen and tell you to pick one that's available. This can be difficult if you don't know how large the screen is or what the layout is like and it was especially puzzling since I hadn't been to any of the theaters before, but I got by with decent seats by just choosing somewhere in the middle, half-way between the back and the screen. Where I'm from, anyway, seats aren't assigned and its first come, first served. 2) Tickets are expensive. 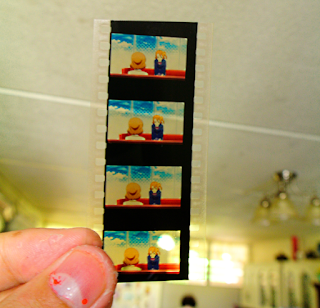 I paid 1800yen (about $15) for each film and that's almost twice what I would have paid normally for a movie on Guam. I'm not sure how that compares to other countries but to me it was a little steep...you do get some cool goodies depending on the movie. For the Love Live! 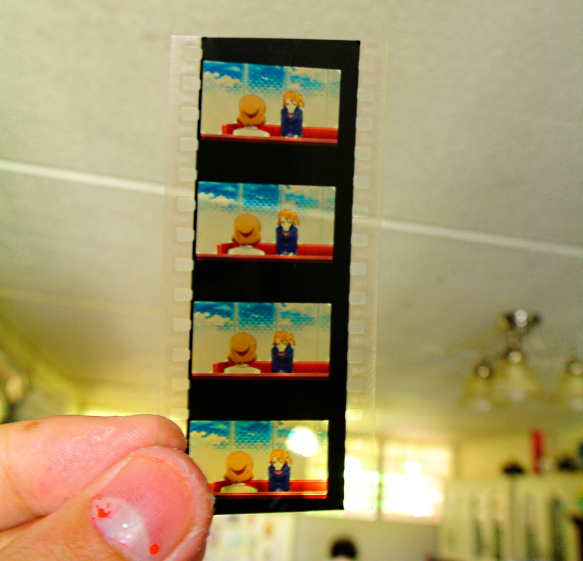 movie, they gave me a randomly packed film strip and I got a special little card and handout for The Anthem of the Heart. 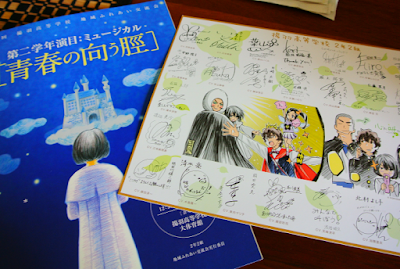 The class in The Anthem of the Heart put on a play and you receive a mock program book and autograph board with all the students' signatures upon entering the theater. 3) The theaters here are notorious for blasting the air conditioning so they feel like freezers - making it mandatory to bring a jacket or something to warm you up. Theaters in Japan weren't cold at all - in fact, they felt kind of warm. I stopped bringing a jacket to the cinema after my first film there. 4) You usually have to wait in the lobby until about 10 or 15 minutes before the movie starts and then they start letting people into the theater. As I mentioned before, seats are assigned so trying to get in early to get seats isn't a big deal. 5) You can purchase tickets online in advance at almost all the places or you can just arrive a little early to secure your ticket. I didn't see any world premiers or first-day showings, but some shows did only have a handful of seats open when I got the box office half an hour or so before the show. If you can, get them online or just pass by the theater before you have lunch and come back for the showing to be sure you get a good seat. I didn't use any of the online reservation systems while I was there so I unfortunately can't explain how they work, but a few theaters did have automated ticket machines that guided you through the process of choosing a seat and paying for your ticket without any of the hassle that comes with human interaction. 6) Thankfully, previews and advertisements were kept pretty minimal. There were only a few ads and a few previews per film, whereas the cinemas I usually frequent at home are known for serving up so many commercial you run out of popcorn. Then again, maybe it was quality over quantity...the jingles and cartoons at the Toho cinemas were absolutely atrocious, appalling, and easily some of the most uninteresting animated gags I had ever seen in my life. Nobody laughed and I'm thankful I had a whole film ahead of me to forget about them. That should probably cover anyone fretting about seeing a film in Japan. Whether you're looking to see some Japanese films before they premier anywhere else or simply looking to see a Hollywood film you may have missed, I hope this guide helps. Stay tuned for my coverage of the films and cinemas I went to in later posts.